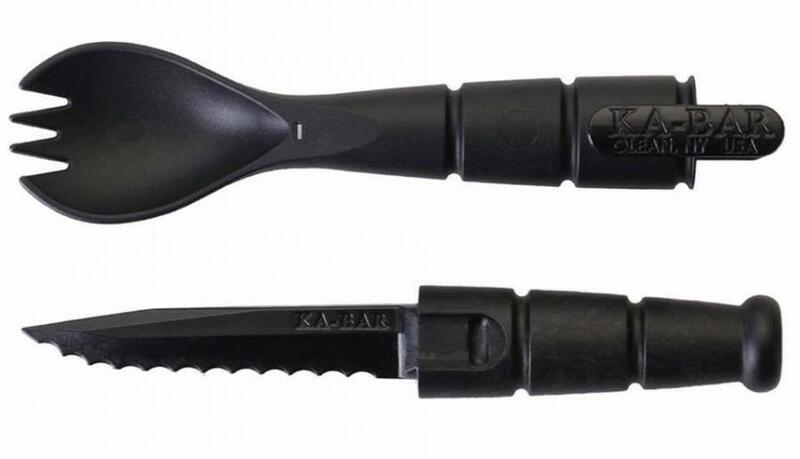 The Ka-Bar Tactical Spork, which is made from food and water approved Grilamid, is equipped with a fork/spoon combo and has a serrated knife hidden in the handle. The knife is accessed by pulling the spork in opposite directions from each extreme end. NOTE: Avoid gripping the flat panel area in the middle of the Spork. It is actually part of it's lock. The tighter you hold here, the more difficult it will be for you to pull out the knife!